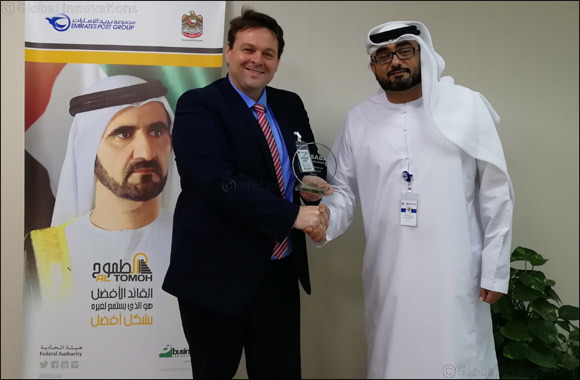 16 April 2018, Dubai, UAE: - Emirates Post Group (EPG), the UAEs leading postal and express provider received the Best Performance Project Award from SABA talent management solutions. The award, presented at a summit attended by SABA experts and their regional clients, applauded EPG for successfully implementing a fully integrated web-based performance appraisal system within a short period of time. “The Group's HR strategy is aligned with other leading institutions within the nation in its electronic transformation of management processes to enhance the performance of employees and the overall performance of our organization in line with the UAEs e-government strategy,” he continued. EPG has adopted a digital transformation to simplify its performance management and appraisal processes. The new ‘Talent Platform', available in both Arabic and English, allows the Group to align, track, analyze, and evaluate employee performance. It is a continuous and more collaborative process, improving communication between managers and employees, as they need to work together to plan, monitor and review objectives through a very simple integrated feature. The system also directly links individual performance indicators with the strategic goals of the Group making personal objectives clear and engaging.